Chicago-based soprano Kelsea Webb has been praised for her superb storytelling and riveting vocal sensitivity. She is quickly becoming a sought-after artist on both the concert and cabaret stages, but is equally comfortable as a chorister with Lyric Opera of Chicago. This month, Webb shares her experience of being a professional chorister. Where did you last sing and get paid? I am currently a core-supplementary chorister with the Lyric Opera of Chicago. Pay is determined by the collective bargaining agreement (CBA) between the opera company and the union (AGMA), so each house is different. Currently, the Chicago Lyric pays supplementary choristers $50–$70 an hour for rehearsals and a flat fee of $250–$280 per performance. The actual rate is determined by seniority. Do you receive health benefits or any other perks? As per our CBA, only full-time choristers receive health benefits; therefore, I purchase private healthcare. We do receive a small payout into retirement each year, so that is a nice perk. However, one of the greatest bonuses of the job is that we receive two complimentary tickets to every dress rehearsal in the season. I have had the opportunity to see many productions that I could never afford to attend otherwise. This is a huge benefit to my work as a singer—to be able to watch and learn from the great singers and production teams and also to be able to support my colleagues. It’s fun to hear all the stories of how a production comes together and then see the finished product onstage. Core-supplementary choristers are typically contracted for one to five productions per season, with a guarantee of at least one production per season. The amount of shows we are called for depends upon the chorus needs of each production. Contracts range in length from one to two seasons, so every supplementary singer must reaudition each year. I am currently in my third season with the company and so far I have performed in six productions. I auditioned on a whim, actually. I had just finished graduate school and was doing my first rounds of professional auditions. I really loved working in the opera chorus in grad school, so I thought I’d at least do one professional chorus audition. I had no expectations of actually getting a contract, but was pleased to get a callback right away—literally the second I left the room! I came back later that afternoon and sang for what I later found out was a core-supplementary position. Since my first pieces were pretty low in my voice, the chorus master asked me if I had anything higher. Thankfully, I had something in my book, so I was able to sing it. I didn’t get the core position that season, but I did receive a supplementary position, which I held for the past two seasons. When a core position opened up for the coming season, I was able to reaudition and was offered the contract. What do you love about the gig? I love my job so much! My colleagues are incredible singers, like seriously some of the best I’ve ever heard, and they work incredibly hard to deliver a solid product every time. I also have the privilege to share the stage with some of the greatest principle and comprimario artists in the world and to learn from them through observation and conversation. Being in the chorus while still pursuing professional solo work is also very helpful for me as an artist. I am able to work on all the other stuff that is not singing, such as acting, dancing, stage combat, props work, dealing with difficult wigs and costumes, and scaling challenging scenery—all without the added pressure of being a soloist. The only drawback to this work is that it is not consistent—my contract changes from season to season. However, for now it allows me some flexibility to continue to pursue solo work, so I have found a good balance. Would you do this or a similar gig again? Absolutely! I believe every aspiring singer needs to spend some time in the chorus. Not only does it teach you how to be a part of a team, but you learn how the heartbeat of the company truly lies in the chorus, orchestra, dancers, and tech crews. I am so grateful for the time I have had in the chorus and for the many seasons to come—in whatever capacity. I think there is still a bit of a stigma about chorus work—that you can get stuck as a career chorister or that choristers are just unsuccessful soloists. This is so far from the truth. My colleagues are some of the most talented singers I have ever heard. They are full of imagination, creativity, joy, passion, and genuine love for their work—and they rehearse and perform six days a week. If you don’t have endurance and technique, you’re not going to make it very far as a chorister. Additionally, they pursue other passions as solo performers, voice teachers, directors, producers, speech pathologists, caretakers, real estate agents, entrepreneurs, and parents. You really can have your cake and eat it too as a chorister. Dr. Michelle Latour is active as a teacher, singer, writer, and adjudicator and lives in Las Vegas. She has been on the full-time faculties at several universities. 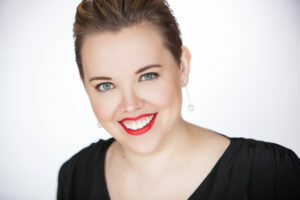 She is currently a voice faculty member for the Italian-based summer program, The International Opera Performing Experience and owns a private studio, the LATOUR Voice Studios. You can visit her at www.thelatourvoicestudios.com, Facebook, Twitter, and Instagram.